Inder Loves Folk Art: Adventures in Preston, California. 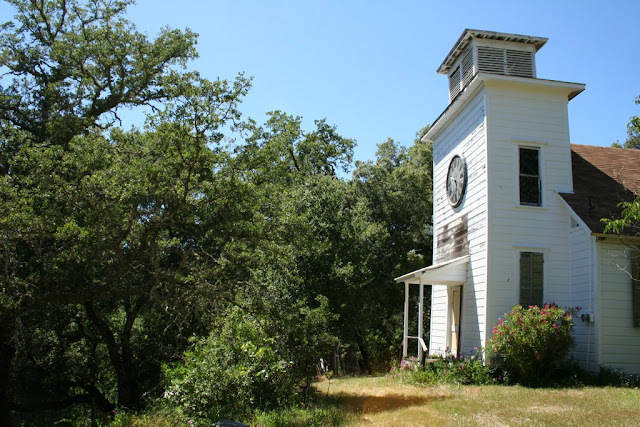 On Sunday, Rebecca, Joseph Roscoe, and I journeyed up to North Sonoma County to attend a Sacred Harp singing in the historic town of Preston, California, near Cloverdale. After driving ninety miles on Highway 101 (is it just me, or has CalTrans been doing road construction on 101 through San Rafael and Santa Rosa since the dawn of time? ), we finally pulled off the freeway into a lonely area near the Russian River and drove up a steep rocky driveway in low gear to a beautiful rundown wooden church surrounded by fruit trees and grape vines in the middle of oak woodlands. She does have a "piercing" gaze, doesn't she? Joseph is going through some rough separation anxiety these days, and can often be found clinging desperately to my person, no matter how hot and sweaty the weather. When I lead my first song, he sat at my feet, arms wrapped around my legs (which made turning to lead in the parts a little awkward), staring suspiciously at the front bench tenors, with an expression that said "Don't you dare try to smile at me!" But by the end of the day, he had morphed from static-cling baby to his more usual boldly destructive persona. Typical Joe! He spent the rest of the afternoon playing in the sprinklers, trying to grab the recording equipment, stealing everyone's water bottles (and banging them around), climbing on pews, and sneaking snacks from the snack table. Once he had warmed up to the crowd, Joe enjoyed riding on Hal's shoulders and riding James' flip-flop like a skateboard. He even sang along a couple of times! More information about Sacred Harp, photos of singing, and photos of Joe's exploits in Preston can be found here. I wonder how much of a coincidence it is that Preston literally means, "priest's town?" Sooo, is the town named after her, or is she named after the town? Anyway, I wish I could have been there. I studied religion in college, and this is right up my alley. I'm glad you had a good time. Fascinating! Church of Heaven on Probabtion - no commas. The church is on probation? Heaven is on probabtion? 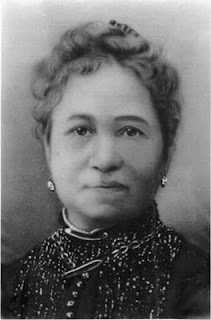 Well, Emily Preston founded the town, so presumably the town was named after her, and the meaning of her name was a "coincidence" (meaning: it is written in the book of life, which is visible everywhere in the air). And Mom, yeah! Part of her belief system involved a probationary period, before you go to heaven? So you're on probation, or heaven is on probation, or both, and then you finally are liberated? Sort of like the Buddhist idea of waiting for all sentient creatures to achieve nirvana before you can really be free or something? Uhhhh, that's how it was explained to us, but again, it's hard to tell, because the grammar is so bad! "Church of Heaven on Probation" is a prime example of a sentence without a clear subject or object. Needs more action verbs!